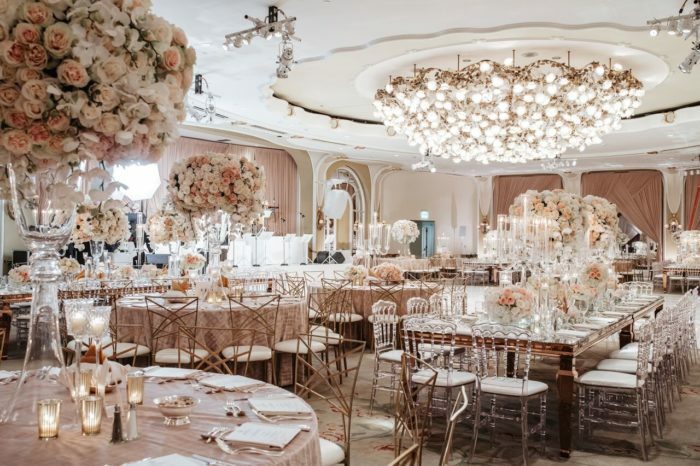 One of our favorite venues is the legendary Beverly Hills Hotel. Their Crystal Garden is a private, gorgeous outdoor area with a built-in gazebo upon which we have designed some of our must stunning chuppahs. 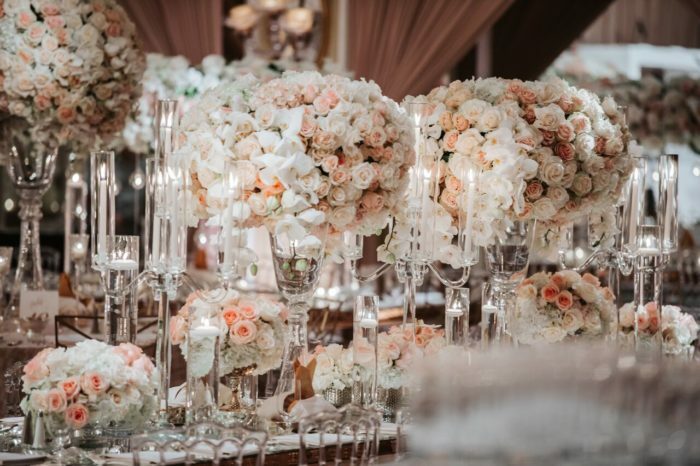 For this event, we brought in a rich spectrum of pinks, ivory, a touch of peach, and greenery to create a romantic atmosphere for our clients. 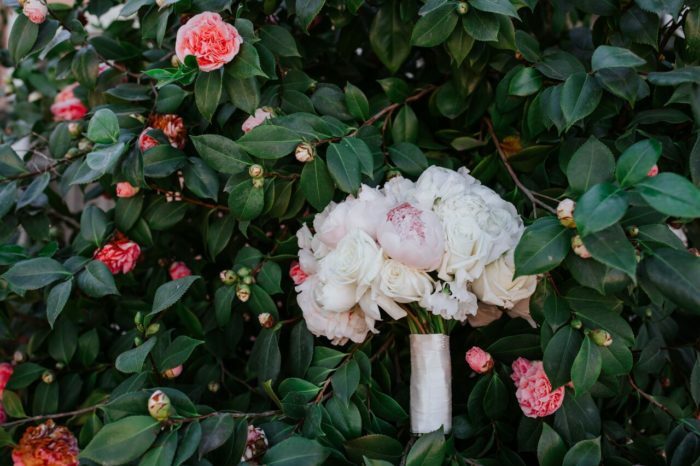 Many brides dream of a peony bouquet, and this bride was no different. Pink and ivory peonies combined with perfect ivory roses for this bridal bouquet. 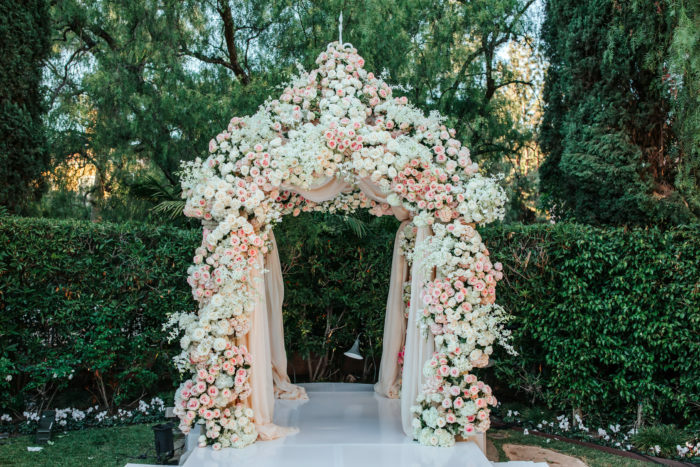 We encrusted the original gazebo with waves of roses and greenery, using varying depths and types of roses to create texture, but keeping the lines crisp for a photogenic and high-impact look. Peachy-blush chiffon added vertical flow and softness to the structure. 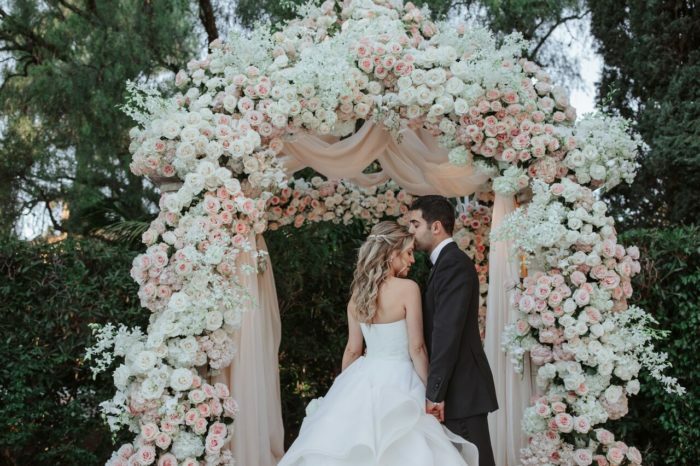 We worked with Palace Party Rentals and planner Kate Carlson of A Kate Carlson Event to create a romantic, dreamy look infused with rose gold, pink, blush, ivory, and gentle glimpses of greenery. 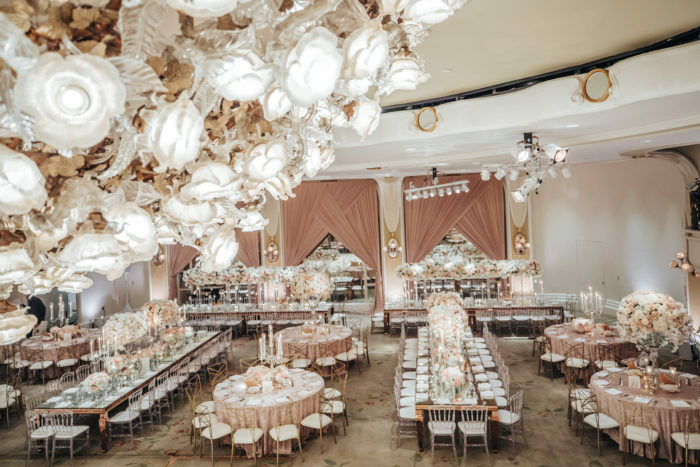 Tall centerpieces combined with candelabras on long tables, and gold chameleon chairs alternated with clear Louis ghost chairs throughout the ballroom. And of course – the glimmer of live candles, everywhere. Our centerpieces contained pops of phalenopsis orchids to add a depth to the overall look. We work hard to credit every vendor involved. If you find a vendor’s name is missing, please email us at info@butterflyfloral.net. Thank you!